Farringdon Road a decade ago, by M@. In the centre of the capital, along a valley floor carved out millennia ago, run two conduits. One is a Street, the other a Road and each is called Farringdon. There are few stretches of London earth that have been so ploughed-up, altered, dug through and paved over, and all in the name of velocity. Piled on top of one another along this grand old ditch are an ancient underground river (the Fleet), a less ancient main road (the A201), a recently re-gilded viaduct (Holborn), a recently re-gilded tube line (the Metropolitan, along with its brothers, the Circle and Hammersmith and City), and an imminent addition: Crossrail. In terms of record-setting, the River Fleet had a pretty good head start on the rest. It was busy carving a channel in the earth when London had yet to become London, and the channel itself had yet to be labeled Farringdon. Eventually, urban sprawl overtook it. The open waterway was clogged with ships, then with sewage, and finally with bricks and mortar. The Fleet’s story is one of pace slowing over time, as it was gradually entombed. Eventually, the Victorians played foul by paving over it altogether and diverting it through a series of subterranean channels. It's now a full-time sewer. It still empties into the Thames beneath Blackfriars Bridge, but only during excessive downpours. The Fleet is a limping nearly-ran in the great race down the ditch it carved out millennia ago. From then on the speed record was up for grabs, and one particular class of contender stood out as the front-runner. 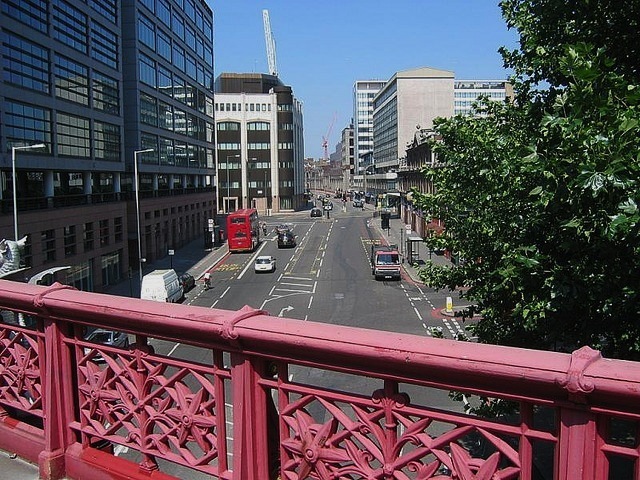 On 8 July 1837 two cabs were seen racing down Blackfriars Road, the drivers flogging their horses furiously. With unfortunate timing a woman stepped out in front of them, was struck, killed and left for dead as the vehicles sped onwards. Justice was not long coming, though, as the cabs were chased down the street by the 19th century’s answer to the Terminator: Augustus Mullings. Having caught up with one of the vehicles and leapt onto its side, the bell-hanger attempted to seize the reins, only to feel the lash of the driver’s whip across his back and hands for the next 180 yards. The case was heard at the Old Bailey, where witnesses made strikingly specific estimates of the speed at which the cabs were travelling: between 12 and 15 miles per hour. The starting point of their deadly race? The cab rank in Farringdon Street. On the evening of 18 December 1858, however, their speed record was blown away by an unlikely contender: a white bull charging at full pelt down Farringdon Street. Startled by a small dog, the beast bolted through Farringdon Market, and on its journey south to Fleet Street tossed a woman (who survived) and hurled a man (who didn’t). But it was only a few short years before the Farringdon velocity record set by the bull (whose name, if it ever had one, has not been passed down) was surpassed by that infamous speed demon well known to us all: the commuter standing with their hand on the rail and a glazed look in their eyes. For in 1863 the Metropolitan line arrived, and Farringdon Street gave its name to the world’s first subway station. History, though, has few foregone conclusions. As the tube line was built, so was an extension of the Street itself, and in the brotherly tussle between Farringdon Street and Farringdon Road the latter swiftly showed its mettle when the terminal was relocated there in 1865, a mere two years after opening. Since then, the station has been ceaselessly funnelling people into the transport network, with the annual number elbowing their way into and out of it having recently passed 20 million. Yet competition is on its way. An idea that started in 1974 is being embodied in the form of yet more bricks, more concrete and vast, tubular voids that will run from one end of London to the other. When Crossrail’s Farringdon station opens in 2018, 140 trains per hour will pass through a station that will be the only interchange in the capital between London Underground, Thameslink and the Crossrail line itself. At that point, old speed records will be challenged and a new chapter will be opened up, as London’s newest ditch crosses its most dynamic.